Pierre Cardin, a luxury brand has come out with a 7 inch Android tablet called Pierre Cardin PC-7006. It is the first tablet offering from the company and the designer tablet comes with a leather cover. The device is priced at £275 (around Rs.20,000) and is currently available on the company's online store only for consumers in the UK. But the company can launch the tablet in other countries in the future. 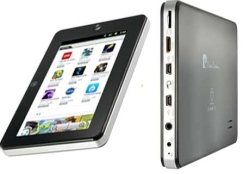 The tablet has a capacitive touchscreen (800x480 pixels resolution) and runs on the Android 2.2 (Froyo) operating system. It is powered by a 1GHz Samsung S5PV210 Cortex-A8 single core processor and has 512MB of RAM. It comes with 4GB of internal storage that is expandable up to 16GB with the help of an SD card. Additionally, it has a 1.3 mega pixels front facing camera and supports Flash 10.1. The device comes with Wi-Fi but can also be used on 3G via an attachable 3G USB modem. The dimensions of the device are 195mm x 123mm x 14mm and it weighs at 520 grams. It has mini USB and an HDMI port and includes a 4400mAh battery. It is true that Pierre Cardin is a very popular designer brand but they should have paid more attention while coming out with a tablet. It lacks in almost every department; the OS in the tablet is an ancient one since Android Honeycomb is already available in most of the tablets today. The camera is not a powerful one and lacks high definition video recording. The internal storage is not impressive and neither is the processor. If the tablet sells in the market, it will majorly be because of the popularity of the brand among consumers and not its specifications. So if you are passionate about tablets, skip this one and instead check out some awesome tablets here, here and here. Although this is not the first time a designer brand has ventured into a popular gadget segment. Vertu's diamond studded mobile phones are considered to be the ultimate status symbols and are very popular among the rich. These mobile phones are studded with precious gems and are usually made of gold. Additionally, Apple's iPhones are also available in 24 karat gold, platinum and diamond studded versions exclusively for customers who can afford them.